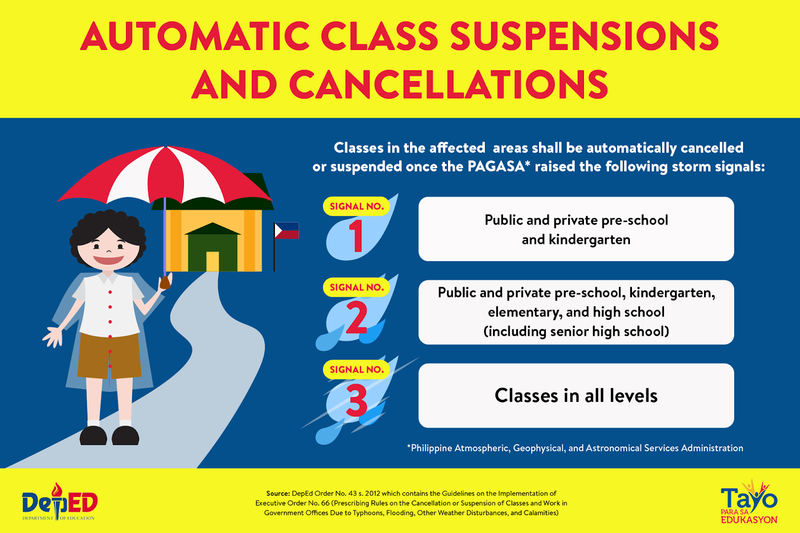 MANILA, Philippines – Classes have been suspended in several areas on Wednesday, September 12, 2018 as Typhoon Mangkhut (local name: Ompong) is expected to enter the Philippine Area of Responsibility (PAR). At 3:00 pm on Tuesday, Mangkhut was spotted at 1,650 East of Southern Luzon. The possible 'super typhoon' currently has maximum sustained winds of 185 kilometer per hour (kph) near the center. Mangkhut has gustiness of up to 225 kph and moving West at 30kph. 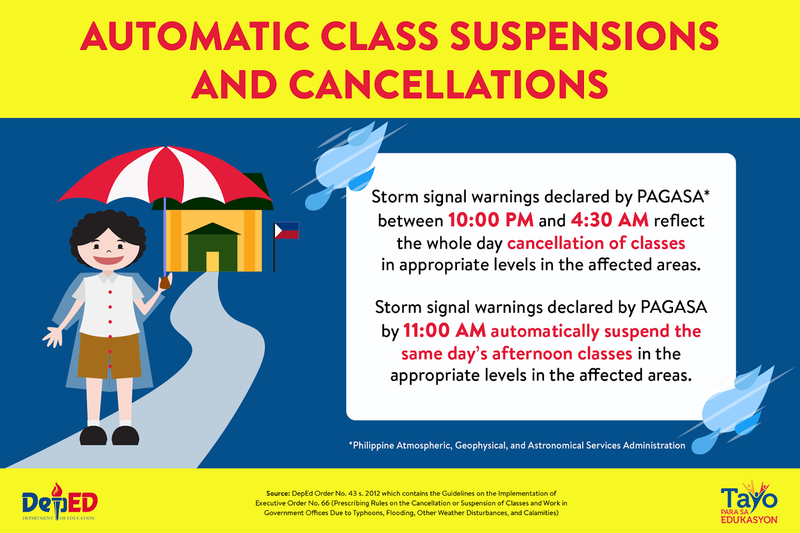 PAGASA categorizes a cyclone with maximum sustained winds of 220 km/h as a super typhoon. This typhoon may reach a peak intensity of greater than 205 kph before entering the country. 'Bagyong Ompong' is threatening Northern Luzon and may traverse the Cagayan - Batanes area this Saturday (September 15). Tropical Cyclone Warning Signal (TCWS) # 1 may be raised as early as tomorrow evening (September 12). The typhoon may strengthen the Southwest Monsoon bringing scattered light to moderate rains and thunderstorms over the Zamboanga Peninsula, Western Visayas and Palawan starting Thursday (September 13). 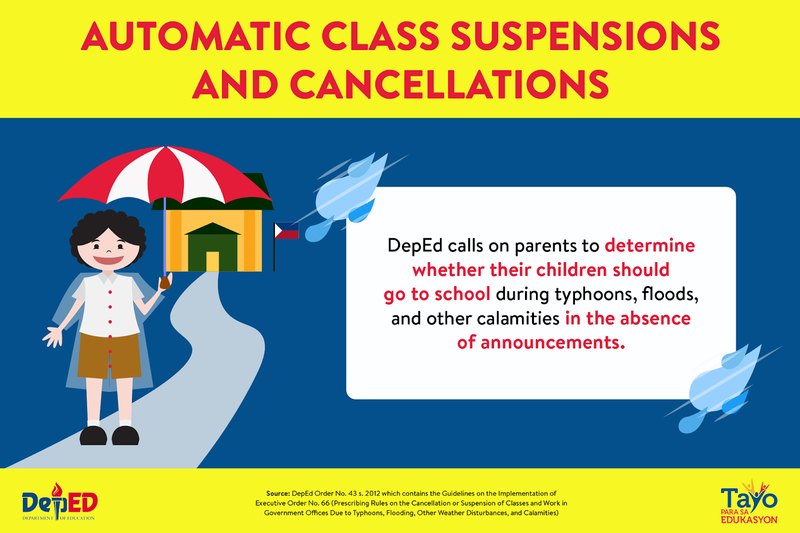 According to the automatic class suspension guideline by DepEd, LGUs have the authority to declare local suspensions in areas where there is no storm signal.